Nobody expects a small device like a watch, phone or tablet to provide a big-screen experience — yet Lenovo showed it's possible to do just that at Lenovo Techworld in Beijing, China. Last fall, Lenovo unveiled the Lenovo Yoga Tablet 2 Pro, a 13-inch tablet with a built-in projector capable of generating a 50-inch picture. And, they were able to fit the projector in without adding bulk to the tablet. This week, Lenovo has topped that achievement with projection technology for smartwatches and smartphones. In its new concept smartwatch, Lenovo integrates a tiny Magic View display into the watchband below the watch face. Peer into the display, and you'll see an image that's twenty times larger than the watchface. And since you have to hold the watch up to your eye to view the image, you can maintain complete privacy from those around you. It's pretty cool, but more flashy than functional. I can only see using it for at-a-glance images or short videos. 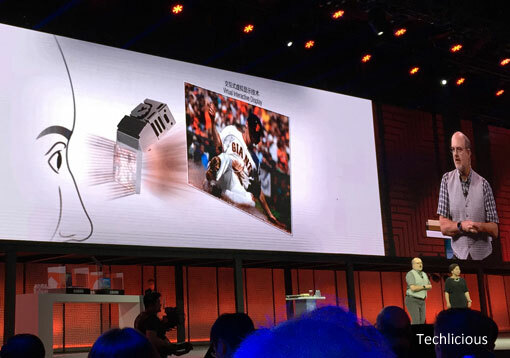 For smartphones, Lenovo pairs its Smart Cast laser projector with an infrared motion detector to allow your phone to detect interactions with the projected image. You could project a full-size keyboard for typing, a piano keyboard for playing music or a canvas for finger painting. The virtual keyboards aren't as comfortable to use or responsive as physical keyboards, but they certainly get the job done. You can see for yourself in the video below. There's no word on when the Magic View or Smart Cast technologies will appear in products on the market. For more information, head over to Lenovo.com. Disclosure: Lenovo paid for travel expenses to attend Lenovo TechWorld.